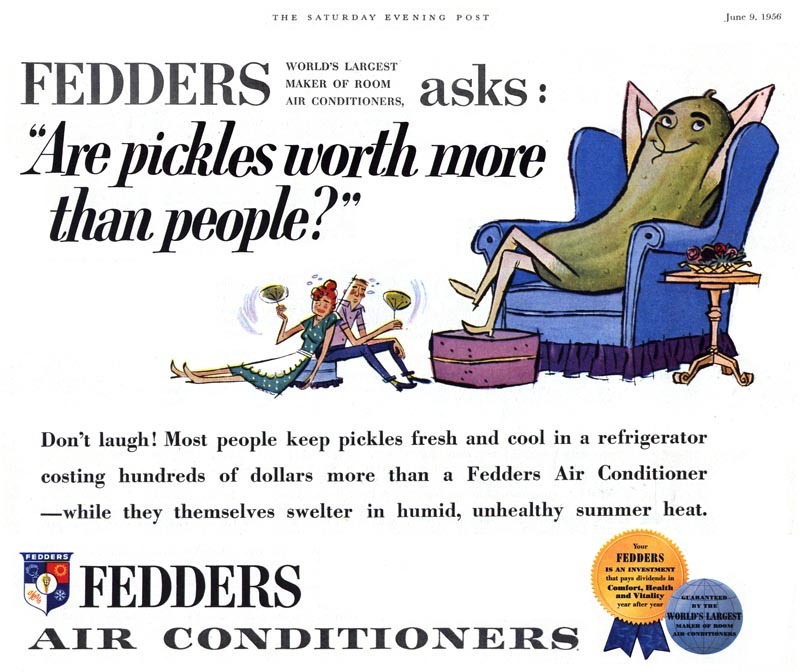 Today's Inspiration: Fabulous '50s Cartoon Ads! Many readers already know that I'm a cartoonist who has specialized in advertising for much of my career. So it'll come as no surprise that I have a real affection for the cartoon art of 1950s advertisments. The reason Today's Inspiration wasn't updated for most of last week is that I had to put every spare minute I wasn't teaching into the preparations for an event I had organized; a day of cartooning workshops/lectures with several of my fellow members of the National Cartoonists Society (Canadian chapter). That event happened yesterday and was a huge success. During my one-hour presentation I spent quite a lot of time talking about and showing examples of the advertising cartoons I've done over the years. So in celebration of that particular cartooning niche, this week I've decided to feature more fabulous '50s cartoon ads from my collection of old magazines. I know I'm not alone in my affection for the styles featured in these ads. The collection I've archived on Flickr in a set called "Ads with Cartoon Elements" has been viewed more than 56,000 times. I think many of today's illustrators and cartoonists are hugely inspired by the unique, clever drawing styles artists like the one who did this 'Oral B' series of ads invented in the '50s. So be sure to drop by each day this week for another batch of mid-century advertising cartoons! And if you'd like to see a few photos from yesterday's event (expertly taken by my son, Simon Peng) and read a bit about what was discussed, drop by the new NCS Canada blog... and please feel free to leave a comment. * My Ads with Cartoon Elements Flickr set. Wonderful ads. I especially love the one for Delco and the first Oral B one. These are so fun. There's so much charm in these ads, and there's almost none in today's. Thanks for sharing. Love the line work in the Delco ads. Follow our trades NOW and profit up to 270% a day.